To Begin with – I like the International Yoga Day! Hope you all enjoyed doing the Surya Namaskars, Tree Pose, Downward Dog and s’more of those poses that have us wanting to try, Yoga! Makes me smile! This post makes me a total thief! A big one! I stole stories from the internet to share some fantastic experiences and emotions on yoga with you! Why – because it’s International Yoga Day and I thought instead of putting up some wow pretzel like pics of me..I’ll share stories…because stories keep the world exciting! Of how Yoga has healed and transformed lives! The first 2 stories however are NOT STOLEN. They were sent to me by two Indians who have reaped a lot from the Practice of Yoga and are inspiring people on Social Media almost every other day! They have given many years of their lives seeking and learning Yoga and still have the humility to say – they just started! Shammi runs her own Yoga Institute by the name of Shammi’s Yogalaya. She is a Yogacharaya and Wellness Consultant. This patience held me unfailingly with my practice. My diet began to change automatically where I left meat completely and turned on to eating fresh, local, homemade healthy food as and when I felt the need to eat. No matter, how hectic my day is predicted to be, I start with my 2 hours of intensive yoga practice.The culmination of these three learnings has resulted in me being – Healthy and Happy. Yoga has taught me discipline. . Yoga allowed me to connect with myself. It made me aware of my own being. Aging has become graceful, beautiful, medication free, supplement free, stress free and at the same time, meaningful and fulfilling. I have tried to impart my learning onto my students trying to gravitate them onto the path of wellness. It is extremely satisfying to realize that I had been able to make them willingly embrace a healthy and yogic life. As a result, many of my students, who had been on medication for years, are completely off medication now. Ailments like diabetes, BP, asthma, bronchitis, sleep apnea etc. are very much under control post them donning the persona of a yoga practitioner. Further, many sports enthusiasts and athletes whom I have been working with, are able to perform better and drastically reduce sports related injuries. Application of Yoga on different levels has made my students live a rich and fulfilling life. Yoga is a way of life, and applying even a few of its techniques is transformative! Yogic philosophy brought home an important lesson… What you experience today, you are responsible for it. How you respond to a situation today, determines tomorrow’s experience. You choose! And accordingly you pave your own path to your freedom. I’ve learned to take ownership and responsibility for every experience I have and for the choices I make. This is eliminating fear. I believe Yoga is helping me grow up! Yoga became part of my fitness programme at least 5-6 years ago, when I added a few Asanas to stretch post my weight training sessions. Today, Yoga Asanas, along with running, comprise my practice. I am a certified yoga teacher, writer and part time baker. I am 44 years old. This is the story of Co-founder of YOGO.tv and head trainer at Vancouver School of Yoga. Lauren got hit by a drunk driver, after which she lived in a dark space so much so that the week she found Yoga was actually the same week she planned to kill herself. She was severely depressed, her left leg was shattered and her lungs had collapsed. The story goes on to say that – through some stroke of luck she ended up being in a YOGA CLASS along with her mother. She says “The class was very intense. I was in a lot of pain. But it was a large awakening where I felt the presence of this energy hold me.” “I surrendered to that energy and in that moment I realized I really did want to live, and that I just needed help. She dove deep into her yoga practice and the story says that she thanks Yoga for saving her life and for helping her heal. Click here for the entire story and for some more short amazing stories on Yoga at Do You Yoga. This story by Shira Atkins is about Dina, who was diagnosed with breast cancer. She went through treatments but finally decided to commit herself to Yoga. She was 50. She started practicing Bikram yoga which helped her sweat out the residual chemo poisons, but it was the aerial Yoga class which finally helped her with lymphedema. The story quotes her “I went into my first class with a pocket of fluid under my arm, and walked out with my lymphedema 100% gone. I said “I’m coming back tomorrow,” and immediately started practicing six times a week. Dina also suffered from the other side effect from chemo – peripheral neuropathy – a situation where it feels like you have stones in your shoes where you used to have toes and the ball of your foot. You no longer feel things directly—all you feel is pressure. Dina’s complete inspirational story weaved with Yoga is here. This is a story from the article “16 Incredible Stories of Healing through Yoga’’ written by Shira Atkins. Click here to read all the beautiful stories in this feature. Confined to a chair, he learned to feel alive in his body again. Click here to read the entire story on what happened to Joe after he started taking weekly Yoga classes and why he doesn’t miss that post marathon run feeling anymore. This story is from the article 6 Inspiring Stories: How the Practice Changed these Yogis Lives. Click here to read the other 5 stories! As for me, I am yet to make my Yoga story amazing…I started doing Yoga when I was pregnant with my first child…8 years back…and there is no looking back since then. 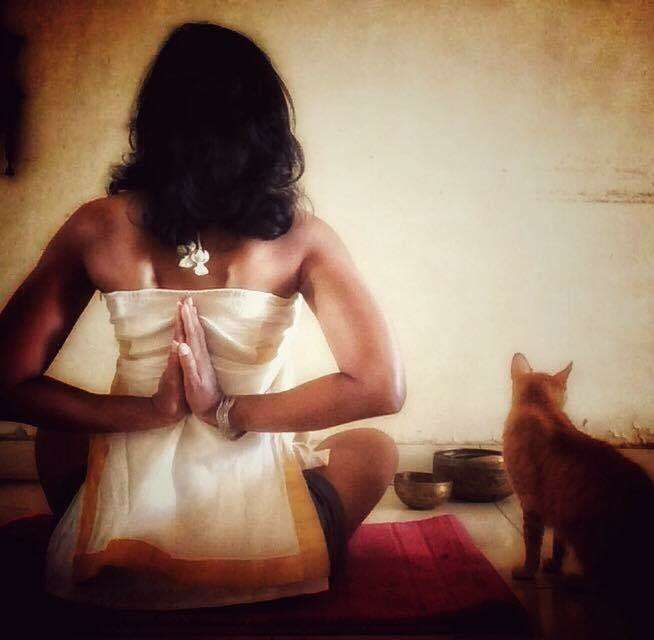 Sometime back, I wrote a love letter to Yoga…Read here..Yoga for me is an expression, connection and fun on the mat. My daughter does beautiful yoga as she often joins me in my practice and that makes me feel I am doing something right. My blog will continue to bring my journey out in the open as I carve my way. I can’t even get started on saying what all I have to still achieve on this journey…inwards…far and wide..
Hope you enjoyed reading the journeys of some of these very common people who have redeemed their lives with their love, commitment and dedication to their chosen tool of fitness, peace and space – Yoga!